A festive patterned vase liner provides a decorative touch to finish off this gorgeous vase arrangement. 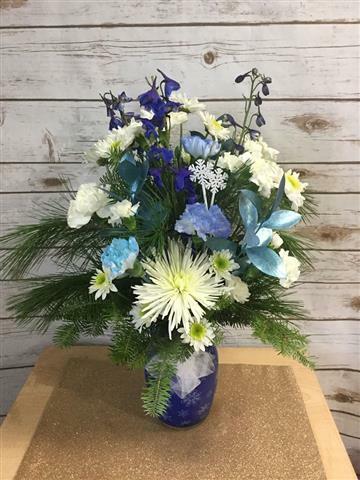 Tinted carnations, miniature carnations, mums, delphinium, and winter greenery are designed in a clear glass vase with vase liner to create a long lasting bouquet. UPGRADE - Add 3 white/ivory roses for an arrangement total of $75.